BATON ROUGE, La. -- Sometimes the pleasure of a morning cappuccino is enhanced when the barista draws a pretty picture in the foam. But a Baton Rouge woman was shocked when she got her beverages at a Starbucks in the Mall of Louisiana, CBS Houston reports. 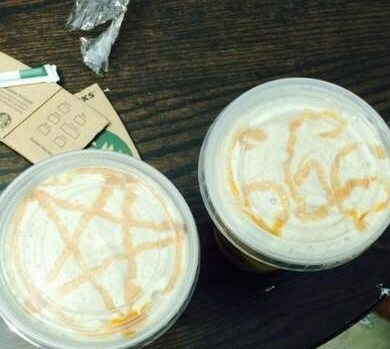 Megan Pinion accused the barista of drawing a five-pointed star in one drink and the number 666 in the other. The pentagram, when oriented with the point facing downwards, is often used as a symbol by devil worshipers. The number 666 is associated with Satan in the book of Revelations. Pinion took a photo of the drinks and posted them to the Starbucks Facebook page. The company immediately responded, reports The Advertiser. "We reached out to her through social media and apologized," said Starbucks social media team spokesman Tom Kuhn. "We're taking the complaint seriously. We're not sure who served her or what kind of beverage it was. It looks kind of caramel-ish in the photos." "I unfortunately can't give the young man's name who served it, because I was so appalled that I could not bring myself to look at him," Pinion wrote in her post. "I am in no way judging his beliefs or dis-meriting his beautiful artwork, I am however judging his lack of professionalism and respect for others." Starbucks also issued a statement, "We have sincerely apologized for her experience. This obviously is not the type of experience we want to provide any of our customers, and is not representative of the customer service our partners provide to millions of customers every day."